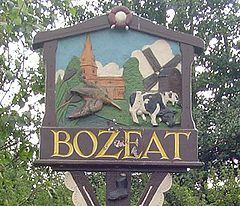 Like many of Northamptonshire’s boot and shoe-making towns and villages Bozeat also has a fascinating and unique story to tell. Today the industry has gone from the village however its legacy lives on through its remaining former factory buildings, notably the imposing Drage Factory building which can be found on the corner of Hope Street and London Road as you enter the village from the A509, and the Electrosite (UK) Ltd building on Easton Lane which was the last factory in the village and county to manufacture the Gola brand created by William Botterill & Son. 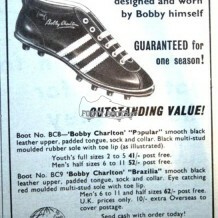 In addition to the Gola connection, the Bozeat Boot Company also formed links with 1966 World Cup England Legends Sir Bobby Charlton and Bobby Moore. To find out more about the Drage Family, Botterills, Bozeat Boot Company and Gola please click on Articles, which have kindly been reproduced with the permission of Philip Bligh and help of Councillor Tom Partridge-Underwood and Robert Wharton. For more information on Bozeat’s boot and shoe-making heritage and village life generally please see Philip Bligh’s excellent publication ‘Bozeat 2000: The Story of a Northamptonshire Village’ available to borrow from libraries across the county. This page was added on 03/06/2013.